On request, Jobfeed did an extensive analysis on 2,5 million jobs posted in the second half year of 2013 in the Netherlands, of which after deduplication 531.800 unique jobs* remained. Jobfeed is the labour market analytics tool of Textkernel that collects and categorises all online jobs in the Netherlands and makes them searchable. To get a good insight into the labour market, Jobfeed will repeat these analyses each half year and compare them to previous semesters. Number from Jobfeed show that 14% of all jobs are targeted at IT people. This makes IT the largest profession class in the Netherlands. Compared to the first half of 2013, the market share of IT increased by 0,3%. The share of Sales and Trading increased by 0,6% ending at a market share of almost 12%. The largest decrease is shown by Healthcare that dropped to the sixth position with 7% market share. 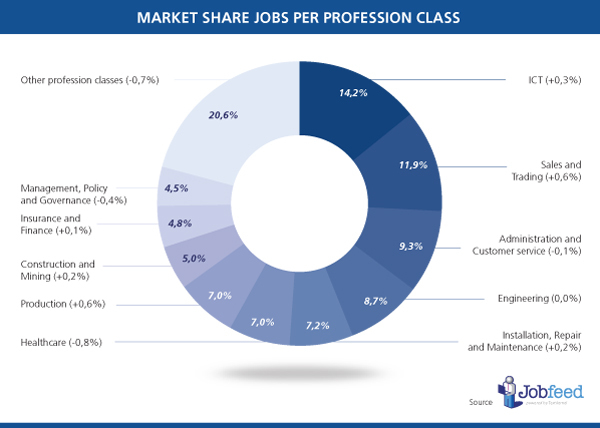 Also the profession class Management, Policy and Governance shrank in market share and dropped from position 8 to position 10 in the top 10 largest profession classes of Q3/Q4 2013. South Holland is the province with most Jobs in the Netherlands and has over 22% of all jobs. South Holland is followed by North Holland and North Brabant. These provinces all show an increase in market share compared to the first half of 2013. Utrecht has risen from the fifth to the fourth place, at the expense of Gelderland that drops 0,3% to a market share of 9,9%. Not only Gelderland decreased in market share. Also the market share of the other provinces in the east of the Netherlands** (Flevoland and Overijssel) shrank. This change becomes visible in the map below. South Holland has the largest number of jobs, but if you are looking for IT jobs, then North Holland is the place to be, according to numbers from Jobfeed. The pie charts show the distribution of the two largest profession classes, IT and Sales and Trading, per province. North Holland has most IT jobs of the Netherlands. Besides in North Holland, also a relatively large number of IT jobs can be found in Utrecht. 16% of all ICT jobs are in Utrecht, while Utrecht has only 10% of all jobs in the Netherlands. For Sales and Trading you are also in the right place in North Holland. More than a fifth of these jobs are offered in this province. Another province that stands out is Flevoland. 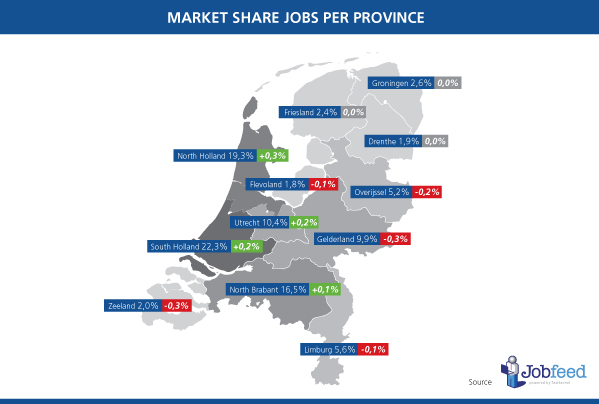 This province has the smallest number of jobs in the Netherlands, but offers more jobs in Sales and Trading than Drenthe, Zeeland, Friesland and Groningen. Jobfeed numbers show that 51% of the Dutch online jobs target higher educated people (from higher vocational education) and 49% target lower educated job seekers (up to vocational education). The first semester of 2013 these numbers were reversed. While the majority of the jobs are asking for a higher education level, only in three provinces is there a bigger demand for higher educated people. Utrecht, North Holland and South Holland have more jobs for higher educated people. In the other nine provinces the share of jobs for lower educated people is larger. Below you can find the number of jobs per province per education level. 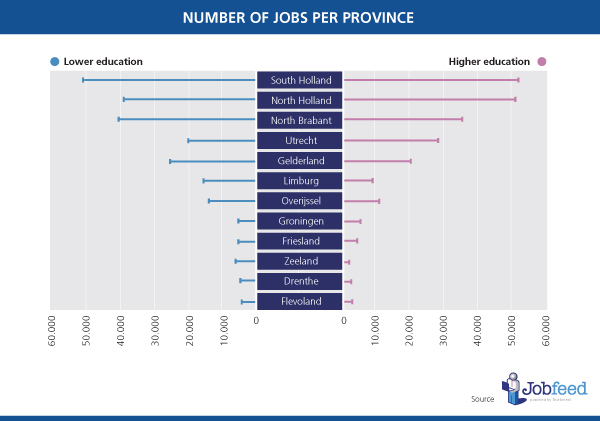 You can also see that Overijssel has more jobs for higher educated people than Limburg, that in total has a larger number of jobs. When looking at the number of vacancies for higher and lower education by profession class, large differences become visible. The vast majority of jobs with a requested higher education level are in ICT. 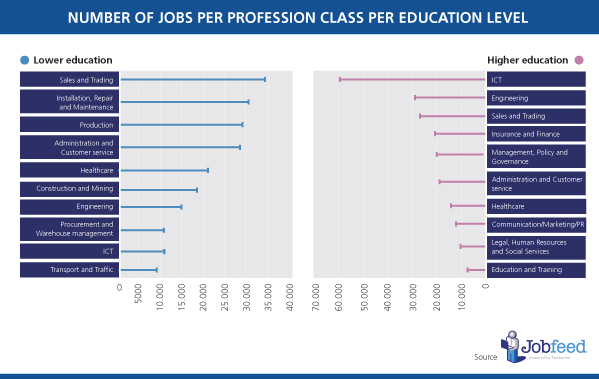 In the top 10 largest profession classes for higher educated people, classes emerge that are not in the overall top 10. “Communication, Marketing and PR”, “Legal, Human Resources and Social Services” and “Education and training” appear in the top ten for higher educated people. For lower educated people, most jobs are in Sales and Trading, followed by Installation, Repair and Maintenance. The overall largest profession class IT, can be found here at the ninth place. Transport and Traffic closes the top 10. Most online jobs in the Netherlands in the second half year of 2013 are in the industry Trade/Retail, followed by Healthcare/Welfare and Manufacturing/Industrial Facilities. Trade/Retail shows the largest increase in market share in the top 10 with a growth of 1,5%. Also IT (0,9%), Manufacturing/Industrial Facilities (+0,7%) and Business Services (+0,6%) show large increases. The healthcare sector lost 2,4% market share compared to the first half of 2013. Another big drop is shown in Education/Research. In the first half of 2013, Accomodation/Food Services was one of the 10 largest industries. This sector shrank in the second half year of 2013 and disappeared from this list to the twelfth place. Numbers come from Jobfeed, the labour market analysis tool of Textkernel, that collects and categorises all online jobs and makes them searchable. For this analysis 2.5 million jobs, posted between 1 July and 31 December 2013 have been analysed, categorised and deduplicated. 530.000 unique jobs, excluding internships, summer/temp jobs, volunteer work and franchises, remained and are the source on which these analyses have been performed. ** Regional distribution according to the CBS: South Netherlands (Noord-Brabant, Limburg), West Netherlands (North Holland, South Holland, Utrecht, Zeeland), North Netherlands (Groningen, Friesland, Drenthe), East Netherlands (Gelderland, Overijssel, Flevoland). For more information on these analyses or about Jobfeed, contact Textkernel.